Some Americans, Canadians and other foreigners believe that ownership of Mexican real estate is difficult, unsafe, or both. Mexico's long-established Foreign Investment Law allows non-Mexicans to acquire coastal and border property through bank trusts (a Fideicomiso) that is held by a Mexican bank. Under this secure ownership mechanism, the bank holds the deed to the real estate for you. The term of a Mexican real estate bank trust is 50 years, renewable for additional 50 year periods. This bank trust mechanism was designed to provide safe ownership of Mexican real estate by non-Mexicans, and to protect non-Mexican real estate owners rights. With a Mexican real estate bank trust your Mexican real estate is not part of the bank's assets and cannot be subject to lien, or attached to bank obligations. The trust is not a lease, and you have full ownership rights to the property. Properties do not pass back to the Mexican government at the end of the trust period -- a occasional misconception and unfounded fear of purchasers from the United States and Canada. Century 21 Mayan Paradise has relationships with the best trust-specialists in Quintana Roo State, and our track record of successful transactions and happy clients attests to the security of this mechanism. We encourage you to contact us for additional information regarding the ownership of Mexican real estate by non-Mexicans, and how Century 21 Mayan Paradise can help make your Tulum property ownership dream secure not only for you, but for your children, grandchildren and generations to come! 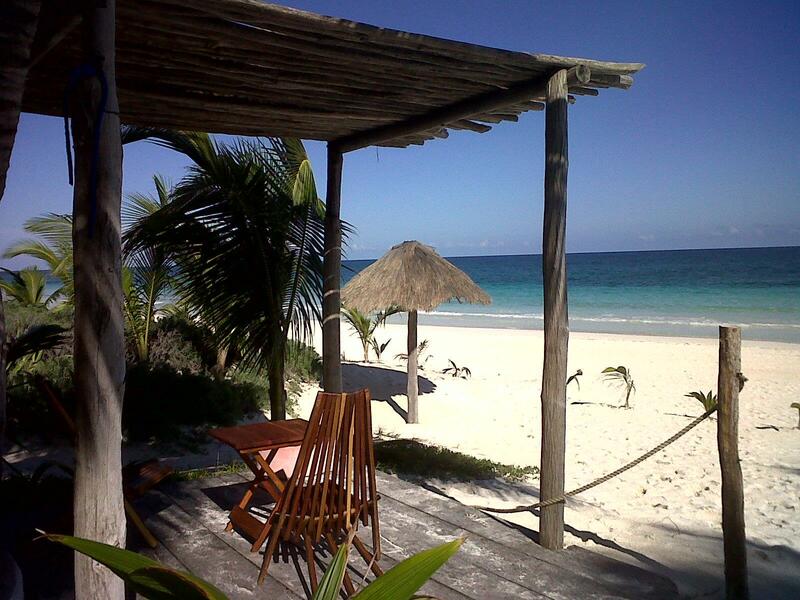 Consider the wonderful lifestyle and economic advantages of booming Tulum Mayan Paradise property ownership! 1 - Are non-Mexicans able to own real estate in Mexico? The answer is YES! It is a common misconception that foreigners cannot own Real Estate in Mexico; in realty it's possible to do so. However, there is a "restricted zone", as described below. Properties anywhere outside the restricted zone can be owned on a fee-simple basis; foreign (non-Mexican) ownership of property is both legal and common. An alternative form of ownership is to purchase non-residential property through a Mexican corporation. Corporations can be, under certain conditions, 100% foreign-owned, if there is a provision in the by-laws that the foreigners agree to subject themselves to Mexican law, refusing possible invocation of laws of other countries. Another requirement is that the real estate acquired under a Mexican Corporation has been registered with the Foreign Affairs Ministry, and is used for non-residential activities. In other words, under said conditions, foreigners can acquire, directly, properties destined for tourist, commercial and industrial use, even inside the restricted zone. For residential purposes inside the Restricted Zone, ownership through a bank trust is required. 2 - Where is Mexico's "restricted zone"? The "restricted zone" is defined as any real estate that is within 30.5 miles (50 kilometers) of Mexico's coast, or within 61 miles (100 kilometers) of Mexico's borders with other nations (Guatemala, Belize and the USA). Within this zone non-Mexicans can own real estate, but are required by Mexico's Foreign Investment Law to do so through a bank trust. 3 - Why did Mexico establish the restricted zone? The restricted zone is enshrined in Article 27 of the Mexican Constitution, and was designed to protect Mexico from possible invasions. While this is certainly a remote possibility today, it is important to remember that Mexico has experienced several invasions, wars, and tremendous losses of territory in its history; the restricted zone is really nothing more than a legacy of that history. From the non-Mexican investor's perspective, the important thing to remember is that Mexico's Foreign Investment Law was designed to facilitate the safe acquisition of coastal and border properties by non-Mexicans, and specifically designed to protect the rights of foreign owners. 4 - What is a Bank Trust? A bank trust, or "fidecomiso" in Spanish, is similar in structure to a trust in the United States. The trustee is a bank, protected under financial laws, and the beneficiary can be any individual, partnership, limited liability company or corporation, Mexican or non-Mexican (which can also be useful tools for Estate Planning). 5 - Is a Mexico Bank Trust a form of Lease? No. A bank trust is not a lease, and confers on the trust-holder the same rights as "ownership" in the United States or Canada. 6 - Are Mexican Real Estate Bank Trusts safe? Yes! The bank simply holds the deed to the property for you or your assignees and beneficiaries. Major International banks such as Banco Monex, Banco Interacciones, ScotiaBank Inverlat, GE Capital, and Santander Serfin, among many, are very active in the bank trust market. Your property is not part of the bank's assets, and cannot be subject to bankruptcy, lien, or attached in any way to bank obligations. As the beneficiary to a bank trust, the property owner has the exclusive ability to make all decisions and to direct all actions regarding the property. The property can be bought, sold, bequeathed, inherited, etc. ONLY with the direction of the trust beneficiary. For over 35 years bank trusts have proven themselves secure for more than 1.5 million Americans and Canadians who are now enjoying the lifestyle and financial benefits of Mexican property ownership. 7 - Will I be able to will my property in Mexico to my children and grandchildren? Yes. The most common and longest term for a trust is 50 years, renewable for additional 50 year periods. In fact, trusts are renewable at any time by simple application. It was never the intent that trust-held properties pass to the government at the end of the trust period, which has been a common misconception of purchasers from the United States and Canada. What happens after 100 years? A new bank trust will be formed to hold the assets for another 50 years, and same rules will apply. 8 - We have been told that a "Notario" will be involved in our purchase and title process. What is a Notario? The Notario Publico is a government appointed lawyer who processes and certifies all real estate and corporate transactions. The Notario is ultimately responsible to the government for the collection of all taxes involved. It is extremely important to remember that a Notario cannot represent you in your real estate transaction; he may offer advice, but he does not, and can not, "represent" you. 9 - How can I learn more about buying real estate in Mexico? Century 21 Mayan Paradise is always happy to answer questions regarding Mexican real estate ownership. Always remember that Mexico wants its non-Mexican real estate owners to feel completely secure that their investment in Mexico is as safe as their real estate holdings in your home country. With just a small amount of prudent effort at the start of your journey into Mexican real estate, your ownership of part of Mexico's magnificent coast will be simple and safe! 10 - Are there Title Processing Companies in Mexico as in the USA? Yes. There are some reputable companies who offer escrow and closing services, as well as US Title Insurance policies to protect your investment. Contact a reputable Realtor to learn more about which is the best to use in the area you are considering a purchase. The real estate industry in Mexico is developing quickly, taking advantage of today's technology, and becoming more similar to the industry as it exists in the U.S. The only national professional real estate organization in Mexico is the "Asociacion Mexicana de Profesionales Inmobiliarios" or "A.M.P.I." (Mexican Association of Real Estate Professionals), an organization similar to, and affiliated with, the National Association of Realtors (NAR) in the United States. Century 21 Mayan Paradise is very active in both organizations. Historically, due to lack of capital markets and high Mexican interest rates, most transactions were made in cash. Financing options with competitive interest rates and terms are now available from US and Mexican banks. Contact Century 21 Mayan Paradise and for more detail, and get a list of different financing options. These concepts are fairly new within the Mexico Real Estate Industry, and are most commonly used within the restricted zones. Using independent escrow services gives both buyers and sellers the increased peace of mind that all appropriate parties will receive funds and titles within the guidelines set forth within the escrow agreement. These service companies have implemented processes and procedures mirroring the US title process. By offering Secure Independent Escrow Accounts, Title Processing, Title Insurance and Homeowners Insurance, buyers and sellers can now rely on these companies to ensure their transactions are conducted in a secure manner. To find your dream Mexican real estate, whether for lease or for purchase, contacting an experienced reputable real estate company is advised. The purchase of any real estate, and particularly real estate in a foreign country, demands safe, honest, experience advice; please don’t do in Mexico what you’ll never do in your native country! By Chosing Century 21 Mayan Paradise, you can be assured the closing will be conducted in the safest manner possible, mirroring as possible US practices through Title & Escrow Service Companies. It is common practice that the buyer pays the transfer or acquisition tax as well as all other closing costs, including the Notario fees and expenses, and the seller pay his capital gains tax and the broker's commission. On January 1, 1996, the federal law regarding the real estate transfer tax, which was 2% for the entire Republic of Mexico, was modified in order to allow each of the Mexican States to determine its own tax. The range may be from 1 to 4% of the appraisal value, sale value or city assed value, (whichever is the highest); in the State of Quintana Roo that tax is a 2%. The rest of the closing costs, which exclude the transfer cost mentioned above, may vary from 3-5% of the sale value, or more as the price of the property decreases, and depending on the particular State and cost of the Bank Trust / Fideicomiso. There is a charge by the bank to the person desiring the Fideicomiso for the preparation of the agreement and establishment of the trust. In addition, the bank charges an annual fee to cover its services as a trustee. 1) The original land cost and the depreciated construction cost, based on the number of years the property was held, and adjusted for inflation according to the official consumer price indexes. 2) Additions, modifications and improvements, but not maintenance, made on the property (construction), adjusted as above. 3) Commissions paid to real estate brokers by the seller. 4) The closing costs, including all expenses, taxes and fees paid by the seller. The Notario will withhold the calculated gain after deductions, and forward it to the Mexican tax authorities. The seller may then deduct this amount against their annual tax return, which becomes an adjustable tax credit in the United States. With Century 21 Mayan Paradise guiding you, Mexican property ownership will be no more complicated for an European, American or Canadian than property ownership in your home country.